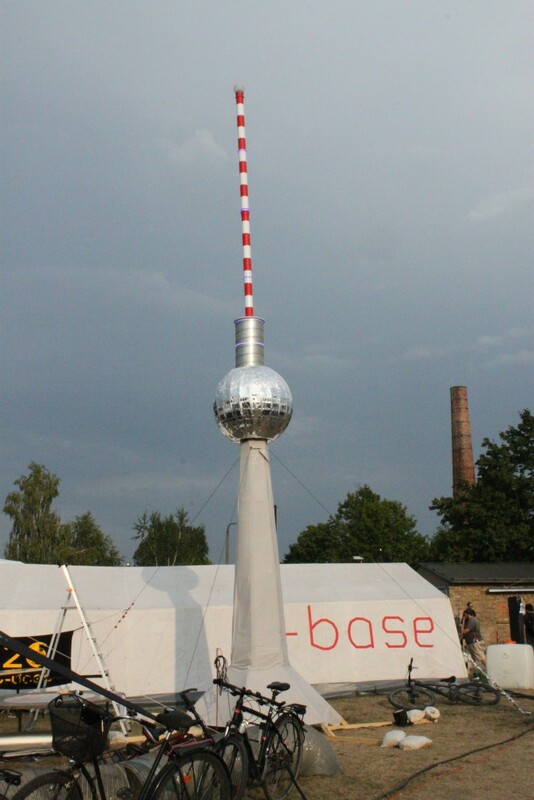 The term c-base referres to both the association c-base e. V. in Berlin who maintaines the club rooms as well as a crashed space station, that is, according to the founding myth of c-base, located under Berlin-Mitte. 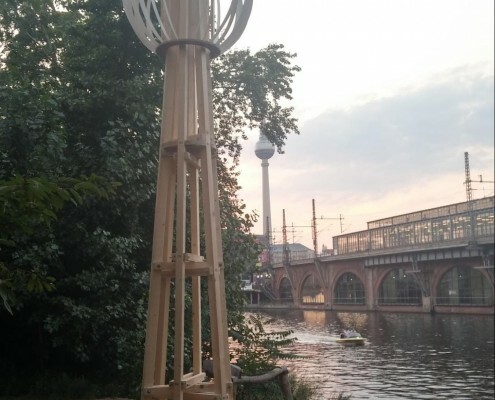 Originally designed as an “extended living room” for the 17 founding members and opened on the 12th August 1995, it developed into the central point of the Berlin hacker scene and is by now internationally regarded as one of the nuclei of Hackerspaces. An important part of the club life is its founding myth. 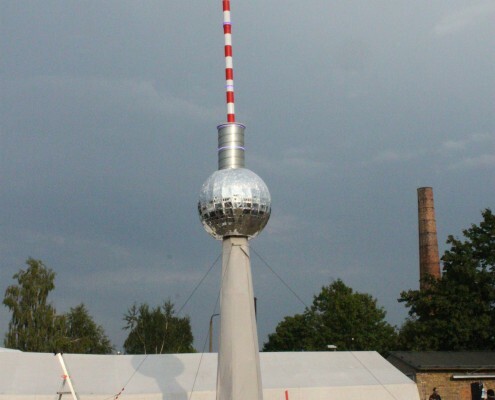 According to the myth a wreckage of a space station lies under the center of Berlin, that is under reconstruction by the association. 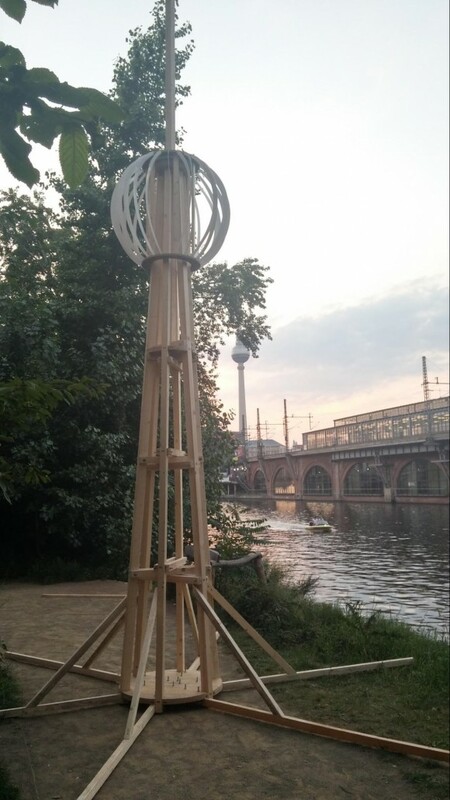 The only part that is visible today is the antenna, that is protruding from the soil in the form of the Berlin TV tower. 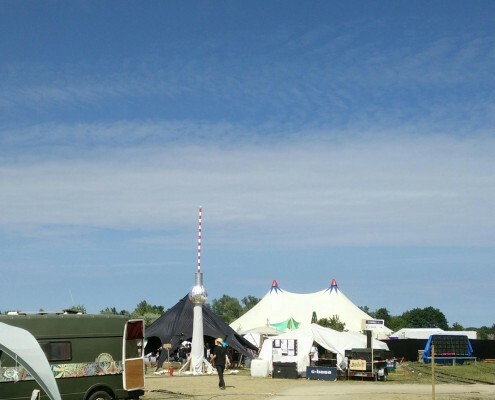 c-base went as a group of about 100 people to the “Chaos Communication Camp 2015” in the former brickyard Mildenberg and celebrated the 20th anniversary of the association there. 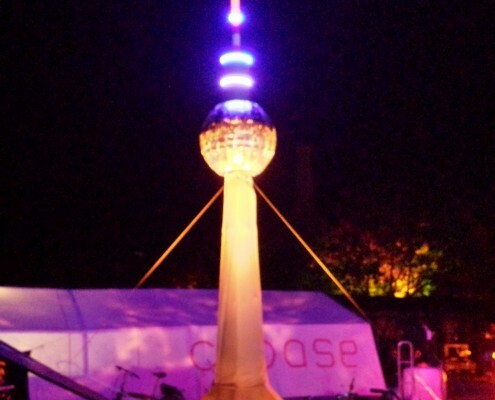 During these celebrations, c-base wanted to show as much of the founding myth in a visual fashion as possible. This height had to be reached with components which do not themselves exceed 5m in length. This limitation was imposed by the material availability in the consumer market and also, this was the longest span that could fit into the logistics vehicles that were rented for this event. The tower consists of two separate parts. 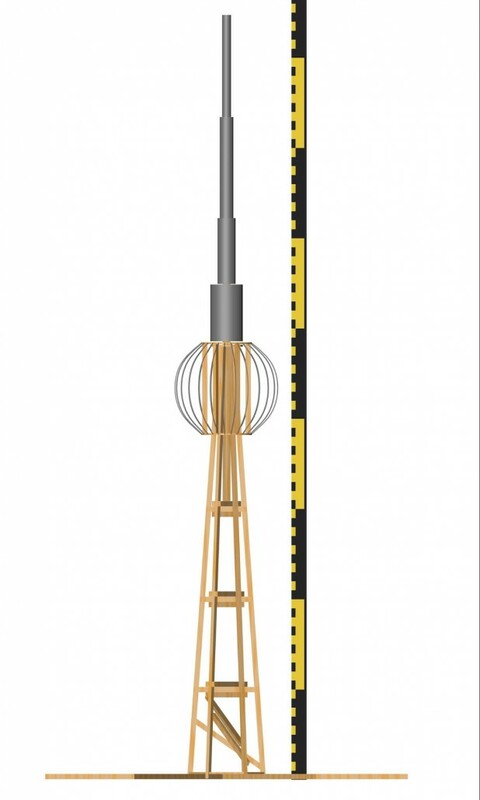 Firstly a 4.80m high substructure which carries the ball at the top and then the tip. 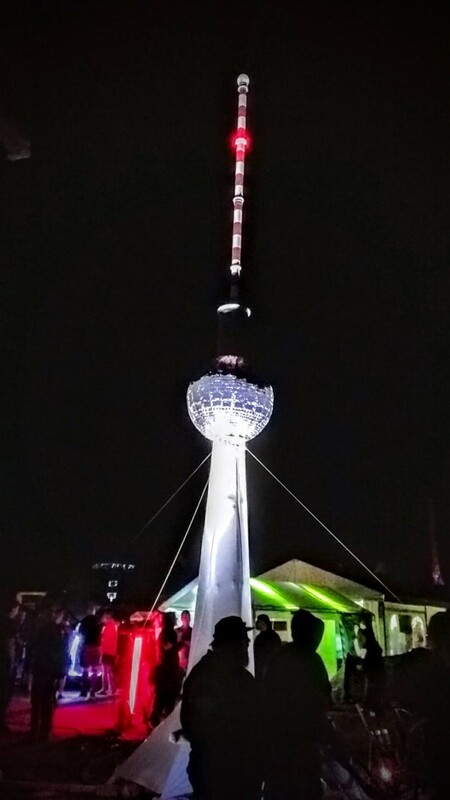 The tip is inserted into the tower and anchored at the top of the tower at a height of about 3.96m. 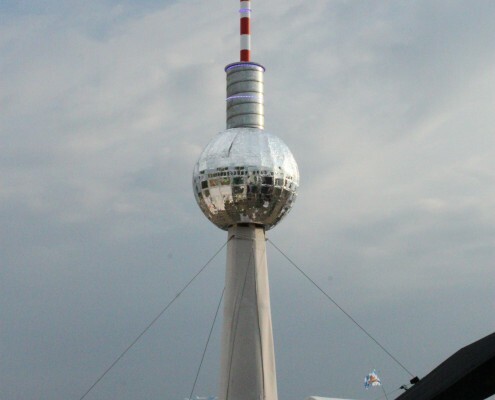 The mechanical construction consisted of bolted-together construction timber using high-strength bolts made from stainless steel (standard size M10). 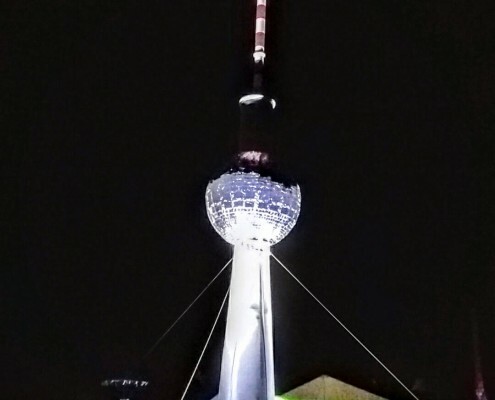 The tower structure consists of 6 vertical beams, arranged hexagonally, with a base diameter of 0.9 m and a tip diameter of only 0.36m. 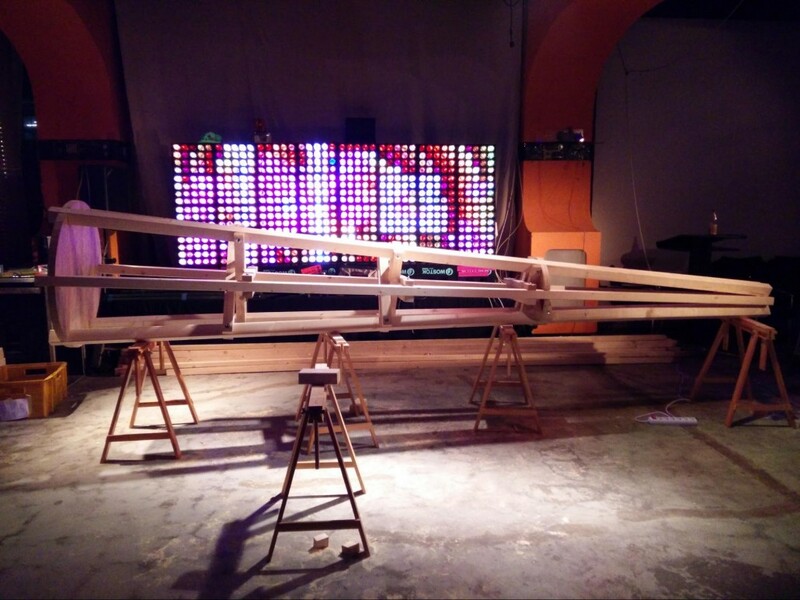 The vertical beams are connected with a total of three horizontal stiffeners separated by one meter wide gaps. 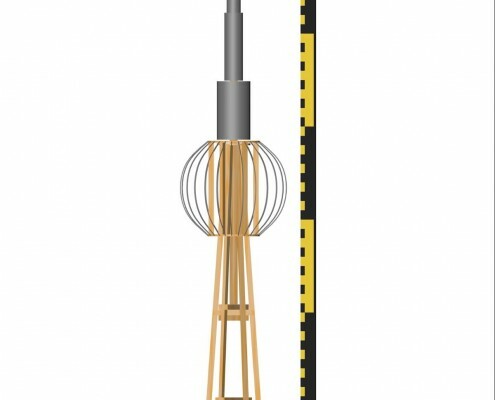 The tip is pushed through the ball, and is anchored below said ball in a construction that is mechanically similar to the mast foot on a sailing yacht. The panel at the upper end of the substructure is both the fixed bearing for the rotating Ball and the pivot bearing for the tip. Initial considerations included the purchasement of a ball made of styrofoam or made from vacuum-formed plastic parts forming a ball, both considerations were discarded for reasons of cost. 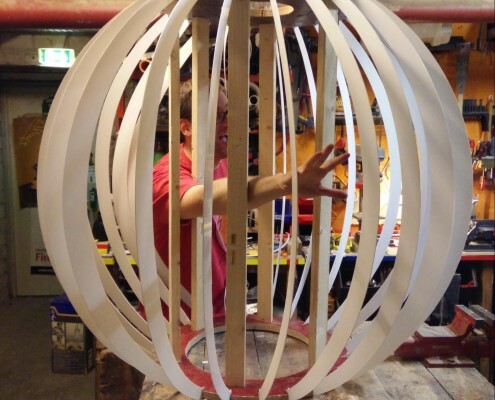 The ball was made of two wooden rings, in which circular cut slats were glued. These slats were made from 2mm polystyrene. 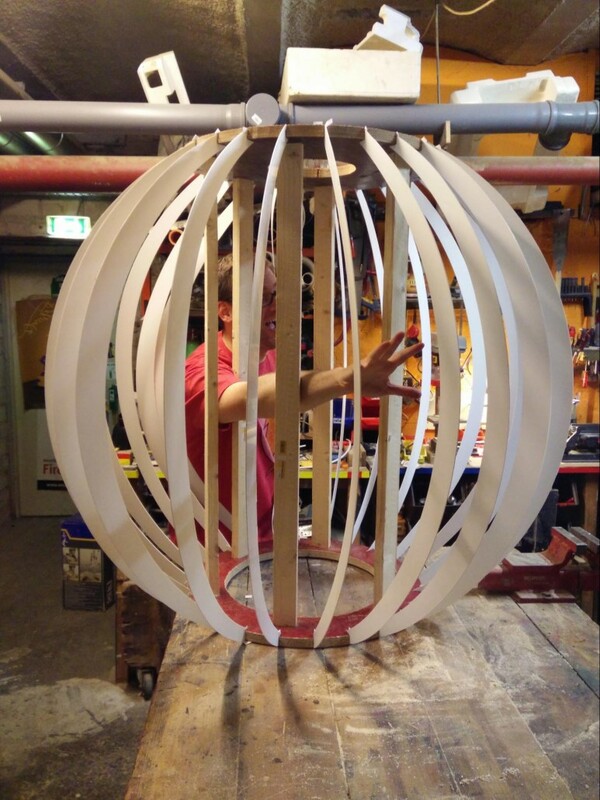 Both rings were connected with 6 wooden slats, that serve as the backbone of the ball. As bearing, we used an Aluminum turntable (lazy susan) mounted on the inside of the sphere. A geared motor mounted above the ball, drove the ball with a rubber wheel so that it turned slowly with about two revolutions per minute. The ball was stiffened with paper-mâché strips and later covered with paper-mâché entirely. After that, the ball got a total of 3 layers of waterproof paint, and finally it was uniformly covered with aluminum foil. The substructure was clad with light gray fireproof stage fabric (molton), for the tip, we used standard drainage pipe. These pipes were illuminated with LED strips. The typical red and white stripes were realized with adhesive foil on the pipes. 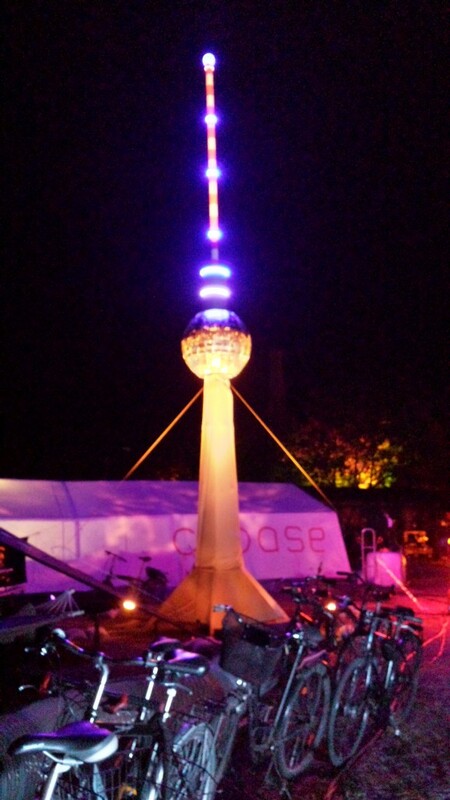 The costs for this project were covered by c-base and were part of the budget for the celebrations of the 20th birthday. The total cost was about 300€, the budget was 350€. Several components such as polystyrene sheets and the cloth for covering were taken from existing resources of the association and therefore did not counted towards the tight budget. 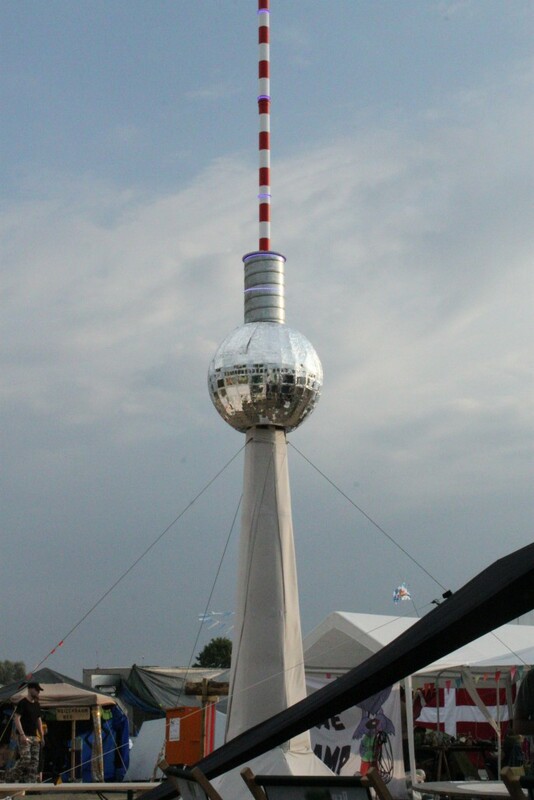 The structure was erected without any coverings on the grounds of c-base for a test., In this installation, the fit of the foot got adjusted and all components were labeled, so that they could be put together in the exact same orientation on the camp grounds. 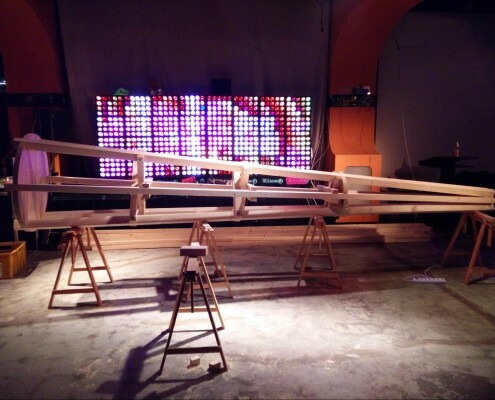 The final installation took place, while the subantenna was lying horizontally on sawhorses. For this purpose, c-base brought a big tent of the type “SG50” that covered the whole construction. 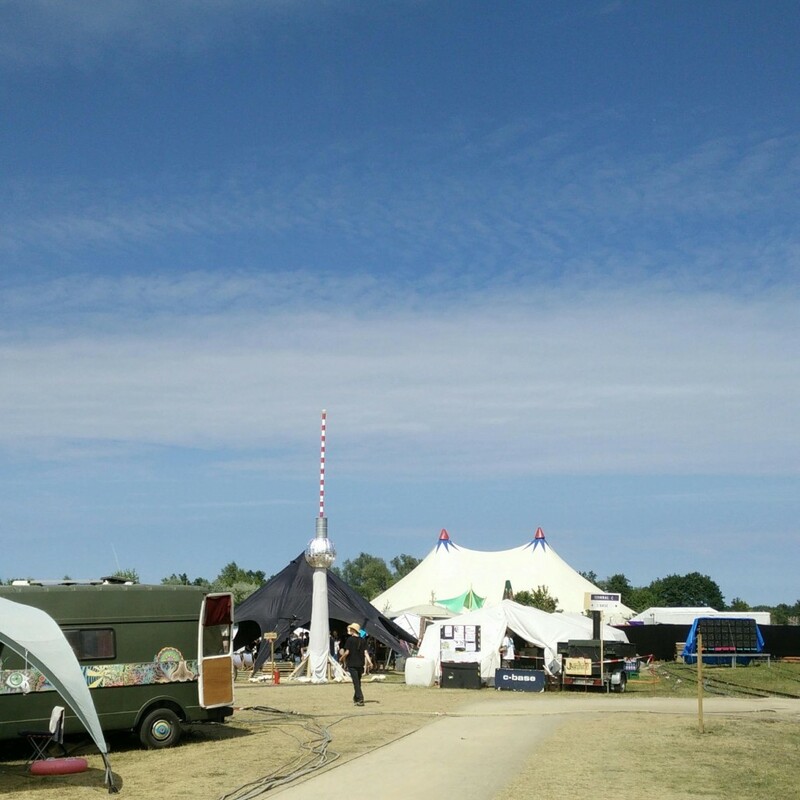 The project was carefully kept secret from the other participants and was therefore a surprise to the other 4,500 guests as well as the management of the Chaos Communication Camp. 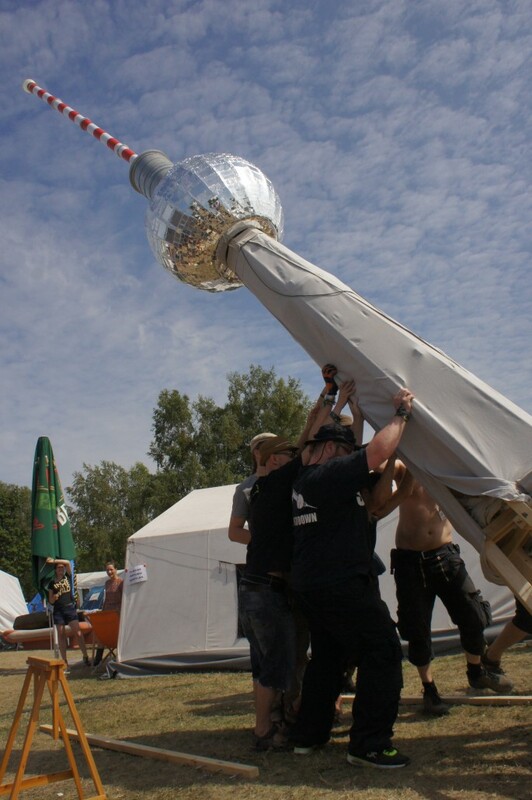 The assembling and erecting of the structure was accompanied by four camera crews (ZDF, RBB, Vice and the video documentary team of the event).